Do you have the Charm? Are you lovable enough? Join the Challenge and get a chance to WIN in the raffle of you very own BROOM STICK! 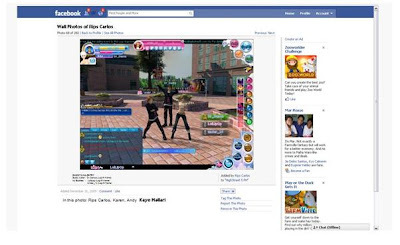 Fly around MetroCity with your cool Broom Stick and parade as one of the most LOVABLE player in HighStreet5 PH! 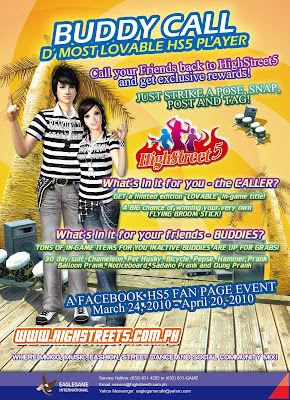 Join the HighStreet5 PH Facebook Fan Page and participate in the most aniticipated HS5 Facebook Activity! 2. Existing/Active players (the CALLER) are required to invite 2 non-active HighStreet5 Player (BUDDIES) to log-in for at least 1 hour for the whole duration of the program. 3. The CALLER who have successfully invite 2 BUDDIES who have not been online for the past 30 days. 4. 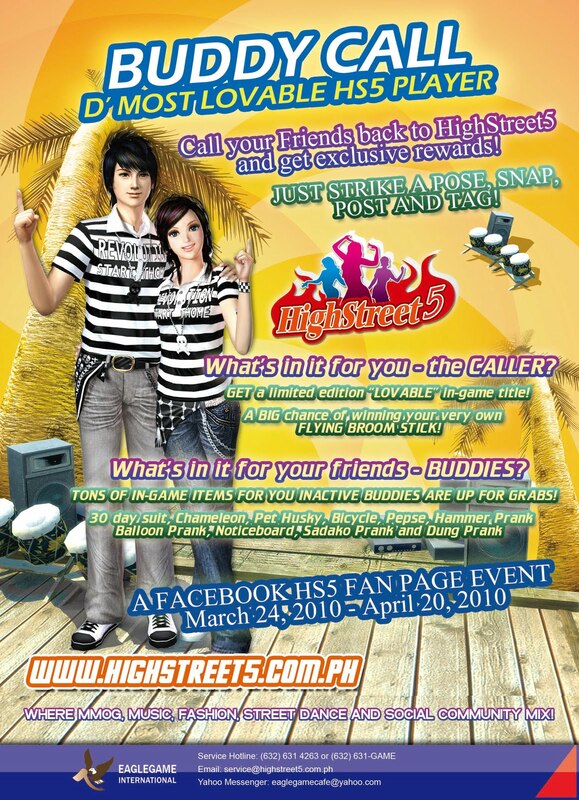 The CALLER must invite his/her BUDDIES to post for a screenshot of them all together and post on the HighStreet5 Facebook Fan Page Wall. 1. In any occasion that the BUDDIES was referred by multiple CALLER (different account profile/s), the first CALLER who have successfully posted their screenshot first is the one that will be counted as entry. 8. SPECIAL RAFFLE PRIZES TO ALL CALLERS! 9. Please allow 5 days for delivery of prizes. 1. Your Buddies did not complete the 1 hour duration required. 2. Your Buddies are not part of the define returning players who are at least 30 days inactive from the day they started playing. WHAT ARE YOU WAITING FOR? CALL YOUR BUDDIES NOW! HAVE A HAPPY WICKED HIGHSTREET5 PARTY!